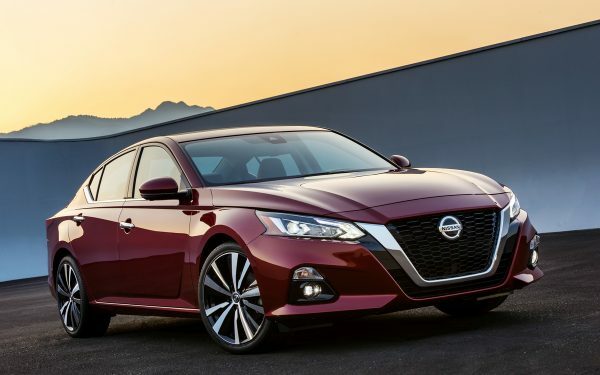 What do you do if you have the number one-selling sedan on the market for 12 years in a row? Redesign it, of course and unveil it in grandiose fashion under the big-top at the 2014 New York International Auto Show (going on right now). The Camry has become a national household favorite with outstanding reliability, competitive pricing, and innovative styling. Did you ever wonder why virtually all mid-sized sedans now resemble a Camry in some manner? If you get a car this right, then everyone will want to take a little piece of it and put it in their sedan. Well, now the pretenders have Toyota’s unofficial official answer with a radically redesigned Camry for the masses. 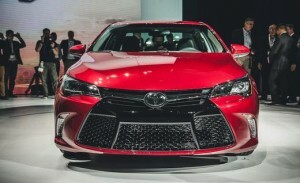 To further underscore the automaker’s desire to meet the needs of the driving aficionado, the Camry will be offered in two even sportier models; the already popular (45-percent of Camry sales) SE level and an all-new XSE level. 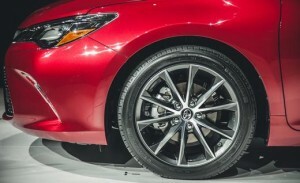 Both will rock the more aggressive front grille and front fascia treatment, which looks as though it could supply ample air for cooling a possible turbo/super-charger upgrade in the future, and the XSE will add 18-inch aluminum wheels, harder neoprene suspension bushings, a higher spring rate, firmer shocks, and a specially tuned power steering setup. The Camry Hybrid will not be forgotten either, a new SE Hybrid trim level offers retuned shock absorbers, a larger anti-roll bar, and firmer control arm bushings. The electronic stability and traction control systems on all Camry models have also been rebooted to allow more driver response and control. 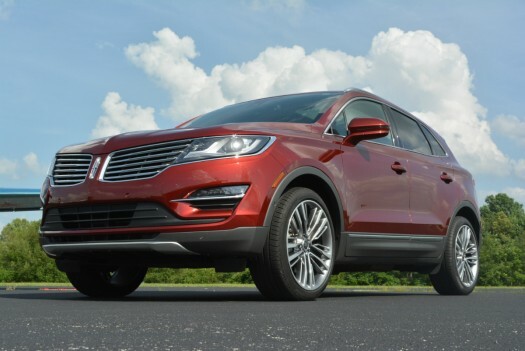 Despite the fact that the wheel base remains unchanged from the 2014 platform, the 2015 model features all-new body panels, with the exception of the roof. The overall body length has been stretched nearly two-inches and the width increased by almost a half-inch. 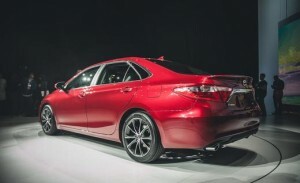 All of the body panels have been aerodynamically designed to yield a more athletic and aggressive stance for the Camry. 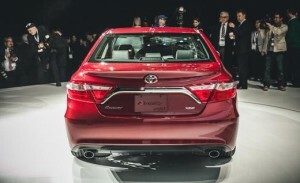 The wider front air dam and grille sweep intensely towards the hood and front fenders, utilizing the new HID headlights, with integrated LED running lights, like jewels in a crown which is appropriate because Camry represents the Japanese word for “crown.” The 2015 Camry has a deeply etched crease that extends from the front quarter panels to the rear, where the newly-redesigned wraparound LED tail lights serve to incorporate the rear fenders and trunk into a single elegant package. 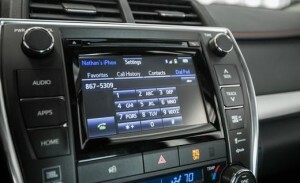 Mass improvements in the level of interior noise can be expected with the 2015 Camry, as this area has been a bone of contention between Toyota executives and engineers in the past. In addition, a newly reconfigured center control stack offers better materials with a 4.2-inch LCD touchscreen display monitor and a wide array of electronic passenger comfort, telecommunication/connectivity, and premium audio options from which to choose. 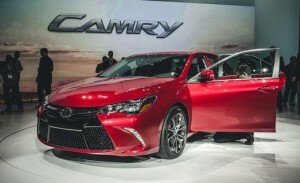 Presently, engine choices are listed as carryovers from the preceding Camry and include a 2.5-liter four-cylinder, a 3.5-liter V6, and a 2.5-liter Atkinson-cycle engine mated with an electric motor for the Camry Hybrid.